My roommate and dear friend Holly and I have had so much fun making her wedding invitations! 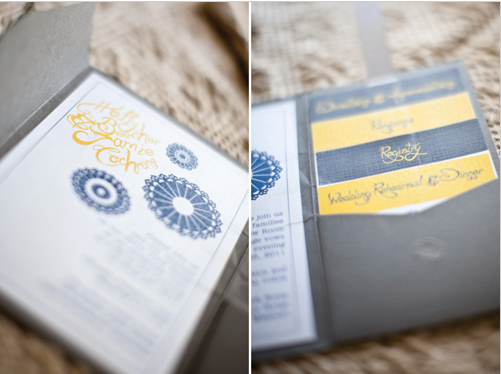 I love her wedding colors of grey, navy and yellow and am beyond pleased with the way her invitations turned out. This was my first experience with a pocket invitation that included not just the invitation but other cards like Directions and Accommodations, Registry, Response and an extra for the bridal party concerning the Rehearsal Dinner. I truly enjoyed making these alongside Holly. She had as much of a hand in the design as I did. The lovely Lily of Lily Glass Photography put up some pictures of the invitations on her blog that look absolutely beautiful. She's so talented! Thanks for the exposure Lily!